Whatever happened to the guy who made the first legal recreational marijuana purchase in the US? 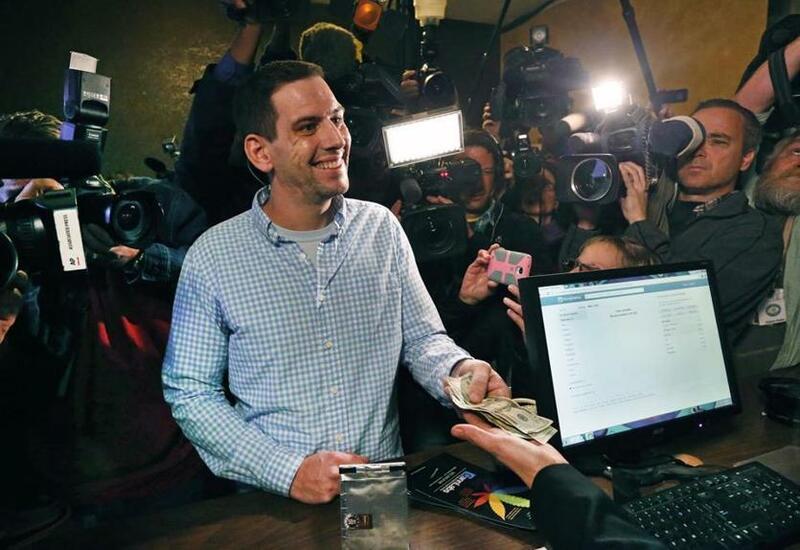 Sean Azzariti, a former Marine who served in the Iraq war and has post-traumatic stress disorder, smiled in 2014 as he became the first customer to buy retail marijuana at 3D Cannabis Center in Denver. Nearly five years later, the small, white paper bag is still sitting in Sean Azzariti’s closet, unopened. He once tried to donate it to a museum, but the curators of the Smithsonian and the Denver Museum of Nature & Science declined, explaining that its contents — 3.5 grams of Bubba Kush marijuana flower and a packet of pot-infused truffles he purchased for $59.74, with tax — were illegal under federal law. Azzariti bought the modest stash at 8 a.m. on Jan. 1, 2014, at the 3D Cannabis Center in Denver, making him the first customer of a government-regulated recreational cannabis store in the United States. With similar scenes set to play out soon in Massachusetts, where recreational pot shops are poised to open next week in Leicester and Northampton, TWIW reached out to Azzariti, a native of Natick, to ask how that moment changed his life and what advice he has for his counterparts back home. I actually still work in cannabis industry. I manage a hydrocarbon extraction facility that makes wax, shatter, and concentrated marijuana oil. What do you remember about the first purchase? I was a budtender at the time. I got a phone call from Mason [Tvert, who managed the 2012 legalization campaign in Colorado]. We had worked together on the campaign and he called out of the blue and said, “hey, listen, you’ve done a lot of advocacy, do you want to be the first?” And I said, “OK, cool.” I didn’t think much of it. I didn’t realize what a big deal it was until I got there that day, probably around 6:30 in the morning, and the parking lot was wall-to-wall full with TV trucks. Inside, the entire place was packed full of people, every single one of them holding a camera. It was extremely intense — the most intense thing I’ve ever dealt with outside the military. My mom and dad actually came with me. You can see in some of the pictures that I’m surrounded by all these professional cameras, and then right next to me there’s a woman holding a tiny pink cellphone — you can’t even see her face, but that was my mom. It was a really special moment to have her there with me. She knew how hard I’d worked to get it legalized. It was a pretty crazy thing to go through. I was never expecting to be thrown in a spotlight like that. It was a whirlwind for a long time. I wouldn’t suggest other people with PTSD do it. Was the media coverage of you fair, or kind of silly? Most of the interviews I did were pretty good. A few were cheesy. There was only one really bad one — some morning show in Florida had me call in and they didn’t take anything seriously. They didn’t understand my backstory. They thought I was like, the most eager stoner who camped out in line. I guess sometimes you don’t have time to do the research. But for the most part, people were professional. What happened afterward? How did that moment of fame change your life? I was talking to people almost daily for like three months, and then it tapered off throughout the year. I was lucky. I got to do a ton of stuff I wouldn’t have done otherwise. It gave me a platform to talk about how marijuana can help veterans. I did a ton of interviews, a lot of speaking engagements — I even went to Congress and did some lobbying. I got to go on the Arsenio Hall show. I mean, I grew up watching that guy. It was a big deal. I had a reporter from Rolling Stone come to my house. I tried to use it all for good, as a platform to continue my advocacy. But it turns out that doesn’t pay a lot. It definitely gave me a leg up within the cannabis industry, though. People knew who I was. I didn’t get crazy special treatment — I’m a hard worker, too — but it was a good foot in the door. One of the crazy things that happened is all the messages I got in my hidden inbox [messages sent by users who weren’t his friend] on Facebook. After maybe a month or two, I clicked on it, and there were hundreds of messages. A lot of them were veterans saying, “I know marijuana could help me” or “this could have saved my dad or my uncle.” They wanted to know how they could advocate in their states. It took weeks to sift through the messages and get back to everyone, but I replied to every single one. I still talk to some of them. Speaking of that, how did you get into marijuana advocacy in the first place? Cannabis saved my life. I wouldn’t be talking to you without it. When I got out of the military in 2006, I was being prescribed obscene amounts of prescription pills for PTSD that were making me a zombie, basically — a non-functional human being. Luckily I was able to find cannabis and experiment with different strains and genotypes and ways of ingesting it that would help me. But it wasn’t just like, “here’s weed, I’m better now.” I used cannabis alongside therapy. That was basically my job — I saw a therapist four to six hours a day for five days a week just to get functional again. But cannabis helped a lot. I feel very lucky that I was in Colorado right when the medical marijuana industry started booming. I always think about that guy in Alabama who doesn’t have access [to medical marijuana]. I know there are veterans out there taking way larger amounts of pills than I did. So I tried to use the platform I had to help those people gain access. Who should be the first customer in Massachusetts? Oh man. I’m not sure how to answer that. Well, you definitely don’t want some college kid with dreads. Don’t do the stereotypical stoner. Maybe somebody’s grandma [whom] marijuana really helps in some way. Somebody deserving who’s going to use that platform to help more people. Oh wait, you know who should do it? [Former Celtics great] Robert Parish — the Chief. He got caught smoking pot. I met him at a CVS in Natick once when I was like 12. I just said, “hey, Mr. Parish, you’re awesome.” He was really cool about it. He shook my hand and just went about his business. That guy — he should be the first. Any advice for all of us in Massachusetts as we enter the era of legal marijuana sales? There’s going to be bumps in the road, just like with anything. It’s a brand-new industry opening up. Hopefully Massachusetts is able to learn from some of the states that have already made it legal to work out how things can go smoothly. If you get the right, dedicated people working in the industry, it’ll work itself out. But it’ll be a crazy hectic first day, trust me. Really I’d just say, go Massachusetts! It makes me so proud this is about to happen in my home state. Dan Adams can be reached at dadams@globe.com. Follow him on Twitter @dan_adams86.